In urban and suburban neighborhoods, street trees add value in many ways, as well as adding aesthetic beauty to the local community. This is a guide about taking care of street trees. 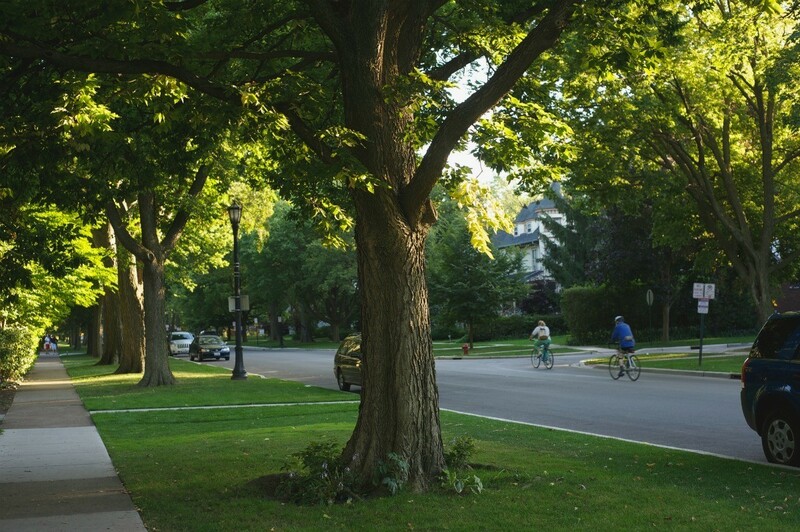 In urban environments, street trees add value by reducing traffic noise, lowering energy costs, increasing property values, and purifying the air, not to mention the aesthetic beauty they add to the local community. Some cities have programs aimed at planting and caring for these trees. In other cities, homeowners are responsible for their care and maintenance, either solely, or in partnership with their local city governments. If "street" trees fall under your care, here are some tips for keeping them healthy and looking great. In cities and towns, trees growing in the easement area along sidewalks and on boulevards (the area between the sidewalk and the street), are called street trees. The city usually retains ownership of these areas (and these trees), in order to maintain access to city utilities. Although street trees are usually selected based on their ability to withstand tough environmental conditions, providing a little extra care and maintenance can greatly increase their chances of living a long and healthy life. Proper watering is essential to maintain the health of any tree-especially newly-planted trees. Concrete and asphalt create run-off, which greatly reduces the amount of water available to nearby trees. You can help street trees develop deep root systems by watering them deeply every 10 days or so throughout the growing season. (Deeper roots are also less likely to damage sidewalks.) To check the moisture level of the soil, dig 4-6 inches deep, about 24 inches from the tree trunk. If the soil is dry, the tree needs water. 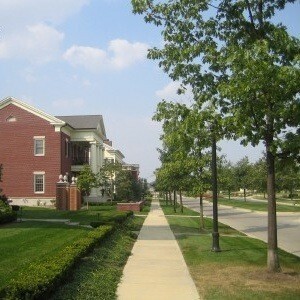 Adding mulch around street trees adds organic nutrients to the soil, conserves water, and suppresses weeds. Use organic materials (wood chips, chopped leaves, grass clippings) to create a bowl-shaped ring of mulch 4-5 inches deep, starting 6 inches out from the trunk and extending to the drip line. Avoid building a mulch "volcano" (a mound of mulch around the trunk), which can trap moisture near the trunk and promote disease. Street Tree "Do's and Don'ts"
Remove or prune street trees until you've obtained instructions and clearance from your local government authorities. Due to the placement of overhead powerlines, and underground utilities, often the Department of Parks and Recreation or Forestry Division takes care of maintenance pruning and removing dead trees. Park vehicles, boats, or heavy equipment under trees. The weight can crush roots and cause soil compaction, which reduces the ability of water and oxygen to reach the roots. Make significant changes in the soil grade near the root zone. Planting ornamentals around a tree is fine (providing local authorities allow it). However, raising or lowering the grade of the soil (e.g. building raised beds or excavating) by only a few inches can drastically affect the amount of water and nutrients delivered to the roots. Attach signs or other objects to street trees that may weaken tree limbs or cause damage to the bark. Use shovels or snow blowers to keep driveways and sidewalks free of snow in the winter. When pedestrian safety becomes and issue, consider using eco-friendly alternatives to traditional rock salt, which is considered harmful to trees, plants, and animals. Protect tree trunks from strikes by lawnmowers and trimmers, and avoid using rototillers within the drip line. Safeguard branches and roots during construction and landscaping projects. Contact local city authorities before planting street trees to determine required setbacks and obtain any necessary permits. In some cities the property owner is responsible for trimming trees in the easement area. If they don't do it the city sends somebody to do and bills the property owner. My opinion is that if they are on city property the city should be responsible. Terrific article Ellen. Here in Australia. Melbourne to be exact.. this time of year can be VERY hot, and also we have drastic water restrictions, ie, no watering of anything between certain hours and only on certain days. A few years ago our local council urged residents to take care of their street trees. HMMM! The problem for me is that I live in a second floor apartment of a block of ten, There is no garden here, just the concrete car park, Also I live at the back of the block, up 2 flights of external stairs. No hose watering could be done, even if I had a hose long enough, so all that summer I carried buckets of water up and down the stairs to water a beautiful little flowering gum which was a street tree a few doors down. However, outside this block, there was a little tree that the garbage collectors smashed to the ground by throwing the bins right on top of the tree. complained to the council, and in due course they sent a worker around to plant another little tree. Same thing! The garbage guys also smashed this one. It split, so I taped up the break hoping it would heal, but it died. I haven't tried for a third tree. I'm too disheartened. 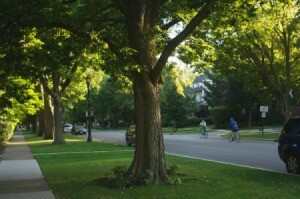 Great points, I think we tend to overlook these trees, but they play a big role in the neighborhood.